Hummus is good for you – especially if you are making it yourself and are in control of what is going into it. I am using really healthy ingredients in mine. Chickpeas are like all beans low in fat and rich in protein, fibre, vitamins and minerals. Sesame seeds contain super-healthy essential Omega-6 fat and are also rich in protein, fibre and a variety of nutrients. I add sesame seeds and oil - in place of a ready-made tahini – to my mine. 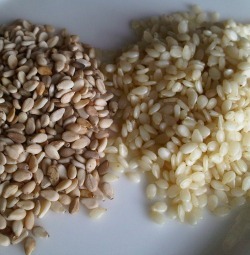 I buy whole, organic sesame seeds and eat them (together with four other seeds) on a daily basis. I don't want to lecture but don't buy refined white sesame seeds sold in supermarkets - like all refined food they are nothing but bad news for your health and weight (you can see the difference in the photo on the right). I eat a fair amount of hummus - almost daily and sometimes twice a day. As long as you don't go completely mad and eat tub upon tub of it, it won't affect your weight very much. 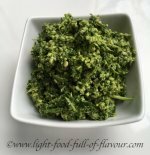 I often spread it on a piece of sourdough bread or some rice cakes and often add a good dollop to my daily salad. For a healthy snack, eat raw vegetables - things like carrot sticks, peppers, celery, broccoli and cauliflower - with hummus. It's a great thing to take with you to work. 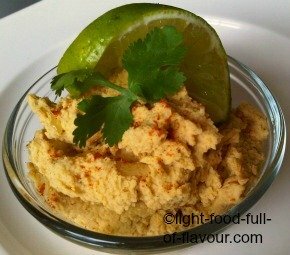 Place the chickpeas, sesame seeds, garlic, cumin, lemon/lime juice and oil in a food processor. Season with a bit of salt and pepper and whizz together. If you find that it is to thick, add some cold water. Or place it all in a bowl and use a stick blender instead. I prefer to use a stick blender – I find that it is much easier to make it this way. I like to mix in some chopped coriander/cilantro and sprinkle a pinch of cayenne pepper over it, but it’s optional.